Musician and educator Dr. Lucas Bernier is currently an Assistant Professor of Music and the Director of Percussion Studies at the University of Mary in Bismarck, ND. 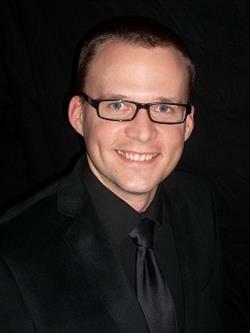 He works throughout the Midwest as a performer, adjudicator, and clinician. Bernier embraces a variety of genres and frequently performs in a diverse range of musical settings including contemporary, classical, jazz, popular, and world music. He is the Principal Percussionist with the Bismarck-Mandan Symphony Orchestra and leads a jazz combo and steel drum quintet. As an active collaborator as well as a soloist, he enjoys performing with musicians throughout the Midwest. Bernier has also recorded contemporary percussion music for the Innova record label. In addition to the University of Mary, he has directed the St. Mary’s Central High School Steel Band and has served as a Faculty Percussion Artist for the Percussion in the Valley Summer Camp, the Lutheran Summer Music Academy, and the University of Iowa Summer Camp. He has also directed the award winning Jefferson High School ‘Band of Blue’ Drumline and Front Ensemble in Cedar Rapids, IA. Bernier has presented clinics and workshops to schools throughout North Dakota and Minnesota, the Percussive Arts Society International Convention, the Northern Plains Kodály Chapter, and the North Dakota Music Educators Association Conference. Dr. Bernier holds degrees from the University of Iowa in Percussion Performance and Pedagogy, and Minnesota State University Moorhead in Audio Production and Percussion Performance. Bernier is proud to be a Yamaha Performing Artist and endorses Innovative Percussion and Sabian Cymbals.